Most people are aware that peanut butter is an excellent source of protein and nutrition but will cross it off the list when it comes to a weight-loss diet plan. Considering that two tablespoons pack 190 calories, 144 of which come from fat, it is not what most of us would call "diet food." Think again. New research suggests that peanuts in all their forms—including peanut butter—may not only help you shed weight but keep it off over the long term. In 2010, researchers with the Department of Nutrition at Loma Linda University assessed the effects of nut consumption on obesity and concluded that an increased intake of nuts was associated with a decreased risk of metabolic syndrome (a disorder characterized by excess abdominal girth and high cholesterol levels). What they discovered was that peanuts and tree nuts tempered the post-prandial glycemic response (changes in blood sugar after eating) while providing the dietary fiber needed to make a person feel fuller faster. A similar study from the Harvard School of Public Health found that women who ate nuts more than twice weekly were less likely to gain weight over an eight-year period. Of the types and preparations consumed, peanuts and peanut butter were the most common. Meanwhile, a Purdue University study reported that people who snacked on peanuts and peanut butter were satiated enough to reduce food consumption, thereby compensating for the increased fat intake. The effect typically persisted for several hours after eating. By contrast, people who ate diet foods like rice cakes or popcorn cakes were usually hungry within a half hour. Even more impressively, increased nut consumption was associated with a decrease in "bad" saturated fat and increases in "good" monounsaturated and polyunsaturated fats. To get the full benefits of peanut butter in a weight-loss plan, you need to limit your daily intake a single serving, or two tablespoons. Some people will consume peanut butter shortly before a meal to temper their hunger. Others will add peanut butter to a reduced-calorie meal to increase the dietary fiber and protein content. If you are counting calories, don't mistake a heaping spoonful for a tablespoon. Instead, fill a proper measuring spoon with peanut butter and level it off with the back of a knife. If you have high blood pressure, find a low-salt brand or a natural peanut butter with no added ingredients. On the other hand, if you prefer peanuts over peanut butter, limit yourself to a third of a cup per day. Opt for dry-roasted, unsalted peanuts which have no added fat. 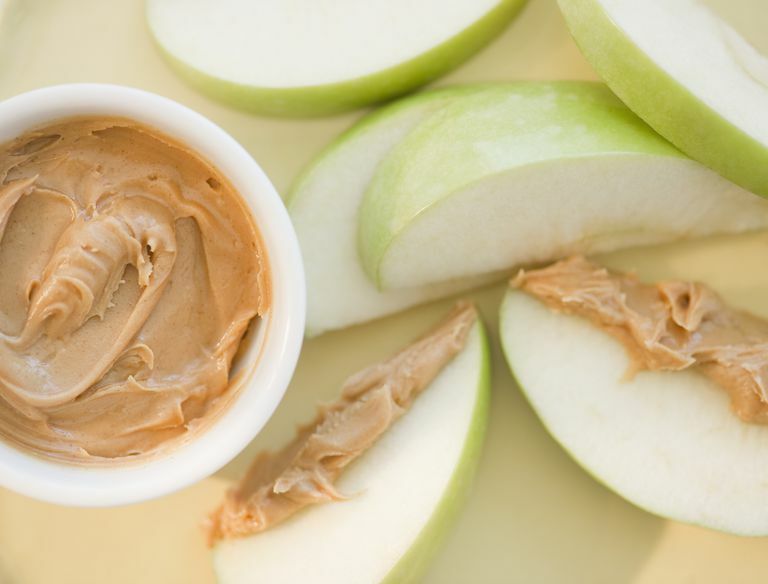 Dip apple slices or celery stalks into peanut butter. Replace croutons in your salad with peanuts. Make your own trail mix with dried fruit. Spread peanut butter onto rice or popcorn cakes. Swirl a tablespoon of peanut butter into fat-free yogurt. Mix chopped peanuts in with low-fat microwave popcorn. Add peanut butter to a low-fat vanilla shake or smoothie. Stir peanut butter into a bowl of oatmeal or cream of wheat. To eliminate added fats and sugars, try making fresh peanut butter. Some health food stores provide customers with a grinder and bulk peanuts to make a fresh supply in-store. Once home, you can add salt and a sweetener if desired. When compared to store-bought peanut butter, natural peanut butter is smoother and mixes well in smoothies. The fat will also tend to separate but can be easily reincorporated with a little stir. With a little moderation and creativity, peanut butter may not only help quell your appetite but keep your diet firmly on track. Bes-Rastrollo, M.; Wedick, N., Martinez-Gonzalez, M. et al. Prospective study of nut consumption, long-term weight change, and obesity risk in women. Amer J Clin Nutrition. 2009;89(6):1913-1919. DOI: 10.3945/ajcn.2008.27276. Flores-Mateo.G. ; Rojas-Rueda, D.; Basora, J. et al. Nut intake and adiposity: meta-analysis of clinical trials. Amer J Clin Nutrition. 2013;97(6):1346-1355. DOI: 10.3945/ajcn.111.031484. Tan. S.; Dhillon, J.; and Mattes, R. A review of the effects of nuts on appetite, food intake, metabolism, and body weight. Amer J Clin Nutrition. 2014;100(Supp1). DOI: 10.3945/ajcn.113.071456. Jordi Salas-SalvadóMarta, J.; Guasch-Ferré, M.; Bulló, M. et al. Nuts in the prevention and treatment of metabolic syndrome. Amer J Clin Nutrition. 2014;100(Suppl 1);399-407. DOI: 10.3945/ajcn.113.071530. Mattes, R.; Kris-Etherton, P.; and Foster, G. Impact of Peanuts and Tree Nuts on Body Weight and Healthy Weight Loss in Adults. J Nutrition. 2008;9(1):1741-45. DOI: 10.1093/jn/138.9.1741S.